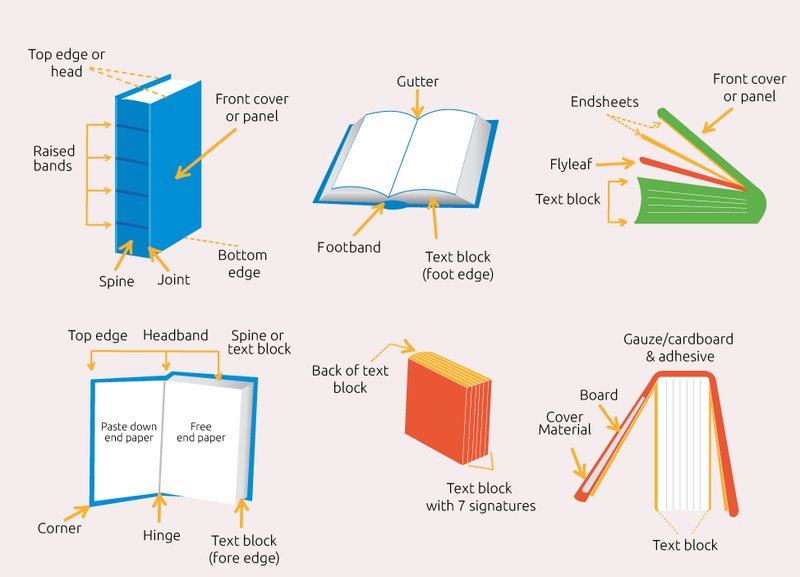 Use the infographic above to familiarize yourself with the parts of a book. Some of the more complex parts we've explained below. Cover Material: Hardcover books are built from cardboard that is wrapped with either a solid color material (typically a colored paper or a leatherette) or a printed text stock (laminated glossy or matte). Endsheet: A piece of paper, usually blank, that's glued to the inside cover of a hardcover book. While the standard endsheet is white and blank, you can choose to have solid-colored endsheets or print on white endsheets. Flyleaf: The flyleaf is the loose part of the endsheet (see above). It is not glued to the cover. Because a flyleaf is part of an endsheet, it can also be colored or have something printed on it. Footband: Similar to the headband (see below), a footband is a special band at the bottom of the spine that hides the glue and helps keep the spine together. Gutter: The space on the inside margin of pages where the book is bound. Anything within the gutter typically isn't visible. Headband: A special band at the top of the spine that hides the glue and helps keep the spine together. Inside Cover (of a paperback): The inside cover of a paperback is the literal back of the cover. It is intentionally left blank. Recto: In an open book, recto is the page on the right side. Signature Block: A bundle of pages, usually in groups of eight, 16, or 32, that begin as one large sheet of paper and are then folded and trimmed to create individual pages. Spine: The outside case of the binding, where all the pages are glued together. When a book is on the shelf, the spine is what faces outward. Verso: In an open book, verso is the page on the left side.